Mount Vernon's New Orientation, Education Center & Museum. 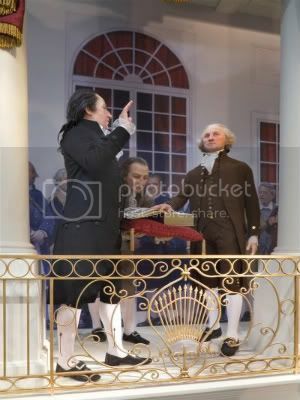 The gallery shows a life-size Washington taking the oath of office on a replica of the Federal Hall balcony in 1789. Visitors have a chance to step Into Washington’s shoes by placing their hand on a reproduction of the Bible upon which Washington took the oath of office. Following prompts, they recite the presidential oath, "I do solemnly swear that I will faithfully execute the office of President of the United States & will to the best of my ability, preserve, protect & defend the Constitution of the United States." * First Inauguration. Location: Balcony of Federal Hall, New York City. * Washington added the words, "So help me God" at the end of his oath. * Washington kissed the Bible, the Holy Bible from St. John's Masonic Lodge, No.1, opened at random due to haste to Genesis 49:13. * Washington delivered the first Inaugural address. * Washington was the first U.S. President & served two terms. For my international friends, a U.S. Presidency term is four years. * First Inauguration in Washington, DC. * First Time a President-elect walked to & from his swearing-in ceremony, rather than riding in a carriage as his predecessors did. * First time a newspaper 'The National Intelligencer' printed the Inaugural address the morning of the Inauguration. * First time the Marine Band played at the Inauguration. The Marine Band has played at every Inauguration since. * Jefferson was the third U.S. President & served two terms. * First President who was not born a British subject. * First time the President-elect & President rode to the Capitol for the Inauguration together. * Van Buren was the eighth U.S. President & served one term. * First Vice President to assume Presidency upon the death of the President, William Henry Harrison. Harrison delivered the longest Inaugural address on record (one hour & a half) & died of pneumonia one month later. The pneumonia was believed to have been brought on by prolonged exposure to bad weather at his March 4 Inauguration. He was not wearing his over coat, hat or gloves. * Tyler was the tenth U.S. President & served one term. * Lincoln's procession to the Capitol was surrounded by heavily armed calvary & infantry, providing an unprecedented amount of protection for the President-elect as the nation stood on the brink of war. * Lincoln successfully led the country through its greatest internal crisis, the American Civil War, preserving the Union & ending slavery. * Lincoln had been the first Republican elected to the Presidency. * President Lincoln was shot on April 14, 1865, by John Wilkes Booth, an actor. Lincoln had been attending a play at Ford's Theater in Washington, D.C., he died the next morning. He was the first US president ever assassinated. Andrew Johnson was Vice President at the time & became President. * Lincoln was the sixteenth U.S. President & served one term plus one month of his second term. * First & only President sworn in for a fourth term. At the height of W.W.II, Roosevelt's fourth Inauguration was simple & austere with no fanfare or formal celebration following the event.There was no parade because of gas rationing & a lumber shortage. * Roosevelt was the thirty-second U.S. President & served four terms. * Kennedy became the first Roman Catholic President of the United States. * First time a poet (Robert Frost) participated in the Inaugural program. * President Kennedy was assassinated on November 22, 1963, in Dallas, Texas. Lee Harvey Oswald was charged with the crime but was murdered two days later by Jack Ruby before any trial. * Kennedy was the thirty-fifth U.S. President & served only two years & 10 months. * Ford is the only unelected President of the United States. Ford assumed the Presidency upon the resignation of Richard M. Nixon. Facing impeachment proceedings for his role in the Watergate scandal & alleged cover-up, Nixon resigned on August 9, 1974. * Ford was the thirty-eighth U.S. President & served three years. 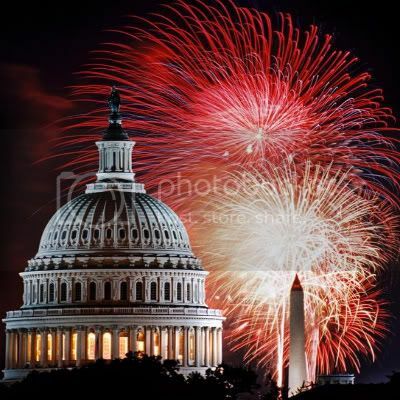 * First Inaugural ceremony broadcast live on the Internet. * Clinton is known as the first Baby Boomer President. * Post First Lady Hillary Rodham Clinton, is currently the first woman to be the United States Secretary of State. Hillary Clinton previously was a United States Senator from New York, & a candidate for the Democratic presidential nomination in 2008. * Clinton was the forty-second U.S. President & served two terms. * First African American to become President of the United States. 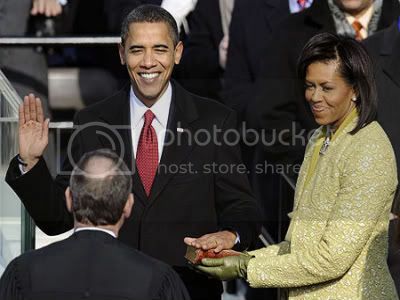 * Obama was sworn in on President Lincoln's Inaugural Bible held by Obama's wife Michelle. A slightly bumbled oath-taking which Obama corrected, (though he did not need to) in the White House the next day. * More people probably packed the Washington Mall than at any previous event in Washington D.C., nearly two million by one estimate. * More people probably watched his speech on television than any previous President, partly because the world’s population has grown, but partly because President Obama has charmed people from Kenya to Karachi. * Headline-writers struggled to find synonyms for 'Historic.' The Washington Post commented on Michelle Obama's apparel. "All Hail the Leader of the Fashionable World." * President Obama must tackle two wars, a calamitous recession & the unexpected. * According to a poll by the Associated Press by a three-to-one majority, Americans are more optimistic with him in charge. * True believers put it more colorfully At the Hawaii State Society Ball on Inauguration night, the consensus was that if Barack Obama can bodysurf at Sandy Beach, Oahu, where broken bones are common & he can, he should be able to handle the Presidency. * Obama is the forty-fourth & current U.S. President. 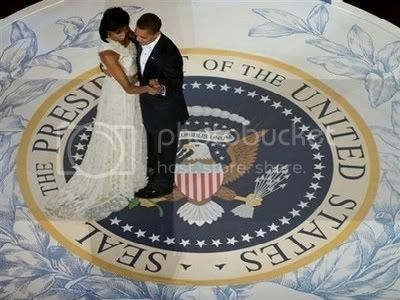 Dancing on the seal-ing at the Commander In Chief Inaugural Ball. President Obama & First Lady Michelle Obama looking chic & sophisticated danced at ten celebration balls before the couple finally spent their first night in the White House. President Barack Obama & First Lady Michelle Obama kissed at the end of their last dance at the Eastern Inaugural Ball, their last ball of the evening. God Bless America & Our New President & His Family. What a wonderful post, Lyndy! It was a great day, and made me feel very hopeful and optimistic about the future! Hi Carolee, thank you for your comment. I know just how you feel. I'm still teary eyed. Finally, a President that means business with truth & openness. President Obama is so eloquent too. Hi Chris, THX for your comment. I'm so happy Barack Obama won. He really has hit the ground running & I'm sure he will be a wonderful President in all aspects. What a wonderful post! I loved reading all the facts and the looking at the Obama photos. Incredibly informative! I learned a lot of interesting facts. If all the teachers in school were as great as you, everyone couldn't help but learn. Hi Jen & Anonymous, thank you for your super comments. I had fun researching our Presidential historical facts. I was amazed at how long these Presidents actually held office. Especially President Kennedy, how sad he didn't remain our President at least one full term & live the wonderful life he & his family deserved.